Now this launcher has more than 1.5 million users per day and more than 500 thousand downloads. 11. 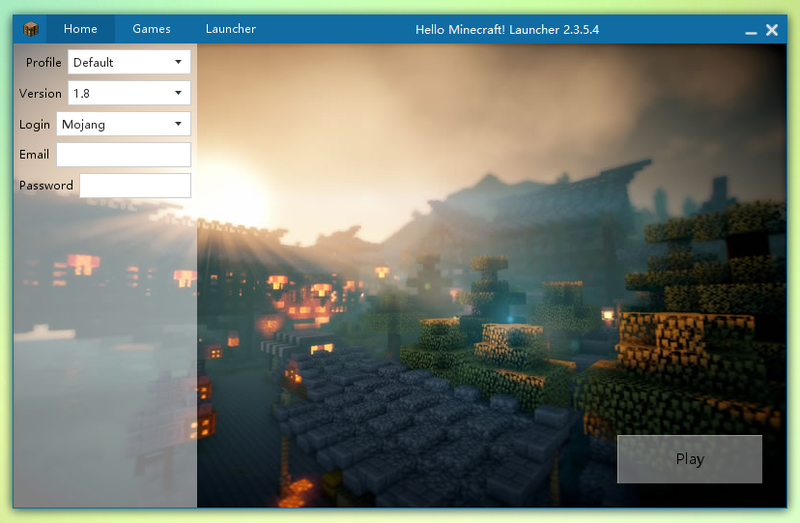 All minecraft versions supported. These files will be selected randomly to show in background. 1. Image files in dir `bg` in the same directory as app executable file. 2. Image files named `background.png` in the same directory as app executable file. 1. Double-clicked app executable and showed a message that The Java Runtime Environment is not found. You are required to install Java SE 8 before using this app. 2. App reports HeadlessException or exceptions about font. If you are in linux, please uninstall OpenJDK and install Oracle JDK instead. 3. Why there is no music played in background when I launched the game successfully? You rejected completing assets before launching the game, complete these files first. Now supports English, Chinese Simplifed, Chinese Traditional, Vietnamese, German. Just a tip, move a lot of those buttons to another page, like don't put background controls on the main page. [18:11:13][main/INFO] No settings file here, may be first loading. how do you install the launcher on mac? How to change speak in launcher? If your environment is English, the launcher will be in English. Nice job huanghongxu!This is your Chinese name? I set my language to english and it's still chinese/japanese language. What to do. May be fixed in 2.3.5.5. Thank you for reporting the problem. One Bug or "feature": In the mods section the add and remove button is still in Japanese/Chinese. That may be fixed now. I did not change the version. Just redownload 2.3.5.5? This laucher is pretty good,I love it so much. If the environment is English,I want to change it in Chinese, what should I do? Could I tell you I am from MCBBS ? Just change your operating system language to Chinese. You ever plan on updating this Launcher? It keeps saying update available but it fails. It sends you to a somewhat suspicious site, and It's not in English? !